Pharmacy retailers frequently receive free prescription drug samples. If you are a pharmacy retailer, one of the things you might want to learn is this: how to manage these samples. Candela handles sample management by allowing you to work these samples into your overall inventory. You can make these samples part of your inventory, enter them in GRN with or without tax, and even check reports to find out the total number of free samples in your overall inventory. While free drug samples are a common occurrence in pharmacy retail, other retailers can also manage free of cost goods in a similar fashion by following the steps below. Let’s now take a look at how samples are handled in Candela in a few easy steps. The first thing you will need to do is configuring Candela to handle samples as part of your overall inventory. Now you are ready to move on to the next step. Select your distributor, and select products to load them in the grid. Enter stock in the Pack Qty column. To enter prescription drug samples, enter them in sampling or scheme columns. Important: Samples are always entered in units. This means if you have received two packets of tablets containing 30 tablets each, you will add 60 in the sampling or scheme column. If you want to distinguish between routine samples and those received under various schemes, enter them separately in Sampling and Scheme columns. FOC column will show total number of samples received under both sampling and schemes. Candela will automatically convert samples entered in units into pack, and will add these pack to the Total Qty. As you can see in the above figure, sixty free units of Abnil Cap were converted into two packs (of 30 capsules each) and the total number of packs became 102. Similarly, Unit Qty column will show total number of units including both regular and sampling stock. If the units entered in the sampling columns don’t make complete packs the Pack Qty column will only include the units that make a complete pack, but the total number of units will be shown in the Unit Qty column. From Decimal point in Qty drop down menu, select decimal value. In the above figure, total number of units entered as sample are 30. While a pack contains 20 tablets, thus the system has created 2.5 packs. Retailers may or may not have to pay tax on free samples. Based on a simple configuration, Candela allows you to handle both these scenarios. 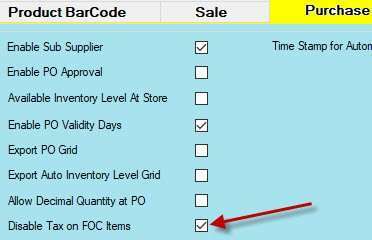 If ‘Disable tax on FOC Items’ checkbox is checked, the system will not apply tax on items entered in sampling and schemes. 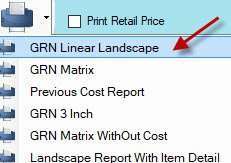 GRN Linear Report: Click Print icon to generate it. Reminder: print icon will become active only when you upload the saved GRN. You can also check details of samples (or free of cost items) in F-05 report. Sample management feature in Candela is a very useful feature for managing all your free of cost goods. It works for both pharmacy retail and all other verticals of retail that handle free samples. If you are using Sample management feature of Candela let us know how you are using it and what you think about it. Share your thoughts in the comments.